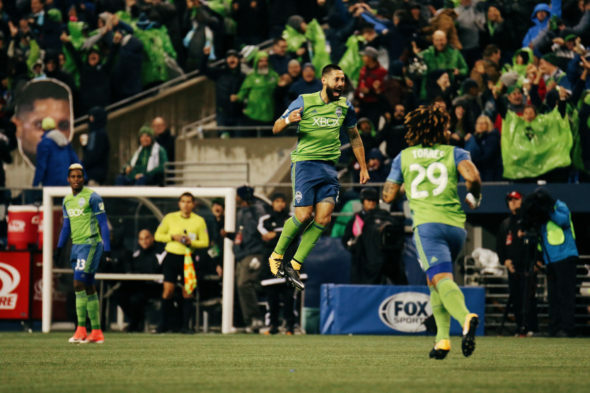 Clint Dempsey, who has made a career of scoring big goals, came up with two more for the Sounders Thursday to propel the team to the Western Conference finals. Clint Dempsey had not scored a goal in the playoffs for the Seattle Sounders since 2015, but only because he hadn’t had the opportunity. After missing all of the 2016 playoffs due to a heart condition, and the first game of this season’s conference semifinals due to a red card, Dempsey made up for lost time Thursday night. The 34-year-old scored two second-half goals to propel the Sounders past the Vancouver Whitecaps and into the Western Conference finals for a second consecutive year. Coach Brian Schmetzer recognized the contributions of his highest-paid player. “He’s worked hard at his craft for many years,” Schmetzer said. “Starting when he was a little kid. His finishing and his ability to find goals in moments is tremendous. Ever since he came here, he’s scored some pretty big goals for his club, and obviously you know the story-line behind him scoring some pretty big goals for his country. Dempsey shot early and often, notching a MLS career-high 10 shots over the span of 90 minutes. The Texas native completed 44 of his 50 passes. The breakthrough came just before the hour mark. In the 56th minute, Will Bruin rolled a ball along the top of the 18 toward Harry Shipp. He stumbled as he approached the ball, but managed to flick it to Dempsey. Dempsey dribbled to his left and lifted the ball over two defenders and past a diving Stefan Marinovic to score the first goal of the playoff series. Dempsey downplayed the meaning of the moment in the context of his long absence from the MLS playoffs, focusing instead on the current significance. Dempsey found some repetition of his own in the 88th minute, converting a floating cross with his right foot at the back post from substitute Victor Rodriguez to alleviate fears of conceding regarding an away goal and begin the early party for the 39,587 in attendance. The victory puts Seattle through to the Western Conference finals to face the winner of Sunday’s Portland-Houston conference semifinal (4:30 p.m., FS1). The two legs of the West finals will be played Nov. 21 and Nov. 30, with the lower-seeded team hosting the first leg. If top-seeded Portland wins, then Seattle would host the first match as the second seed. The Sounders now get a 19-day break, part of which will be occupied by the FIFA international break Nov. 6-14. Schmetzer said the long break was both a blessing and a curse, but it wouldn’t change his team’s preparation. “I gave them the day off tomorrow,” Schmetzer said. “Then we’ll go back to work, and do all of our normal stuff, try to get some practice games against the S2 guys. Obviously, the international guys will be gone. It’s a couple days more than what we had last year, but we’ll adjust. We’ll make do. The break may allow for the recovery of Osvaldo Alonso and Gustav Svensson, who have dealt with lingering muscle injuries. Jordan Morris may also be able to return after straining his hamstring Sept. 10. The Sounders have not conceded a goal in their past four matches, and are 10-2-8 in their last 20 MLS competitions in the regular season and playoffs. If the defense remains steadfast, and Dempsey continues making up for lost time, the Sounders may recapture the energy that helped Seattle surprise American soccer and win its first MLS Cup.